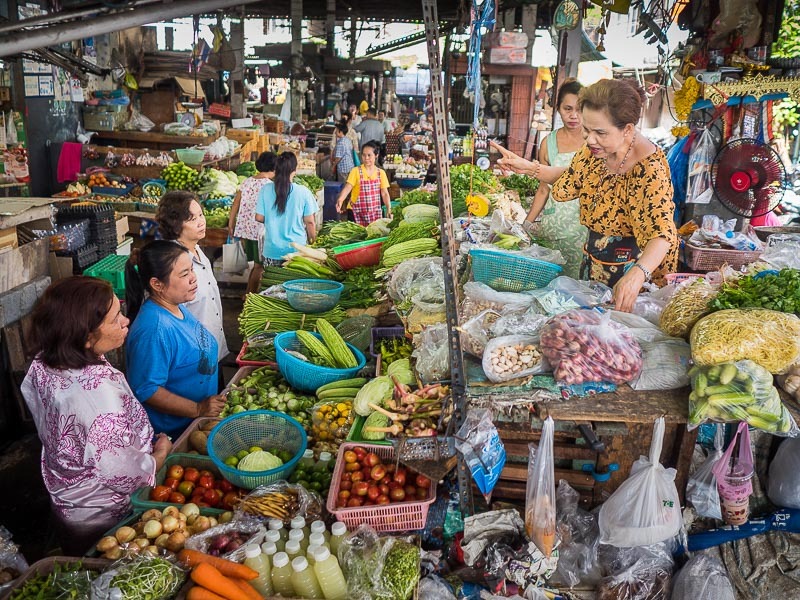 Buying and selling vegetables in the Bang Chak Market. 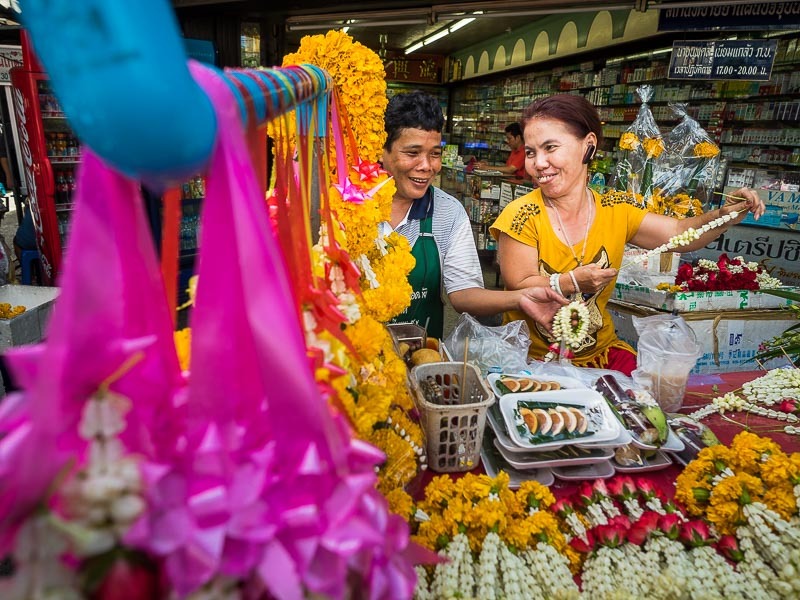 There was a time, not that long ago, when most people in Thailand shopped in local markets. When we were growing up here, in the mid 1960s, being attached to the US diplomatic mission meant we had access to the military P/X - Post Exchange, which was sort of a department store and commissary, a grocery store. But Americans not attached to the Embassy, and most other ex-pats, had to "live on the economy," that is do all of their shopping in local markets. People walk through Bang Chak Market. Of course it never occurred to me that we were the outliers, that in fact most people in Thailand lived on the economy. At the time I thought living on the local economy was a mighty feat. Up there with the moon walk and jet packs (I was also only 10 years old). Now I realize that Thai markets are some of the most dazzling places in Bangkok. 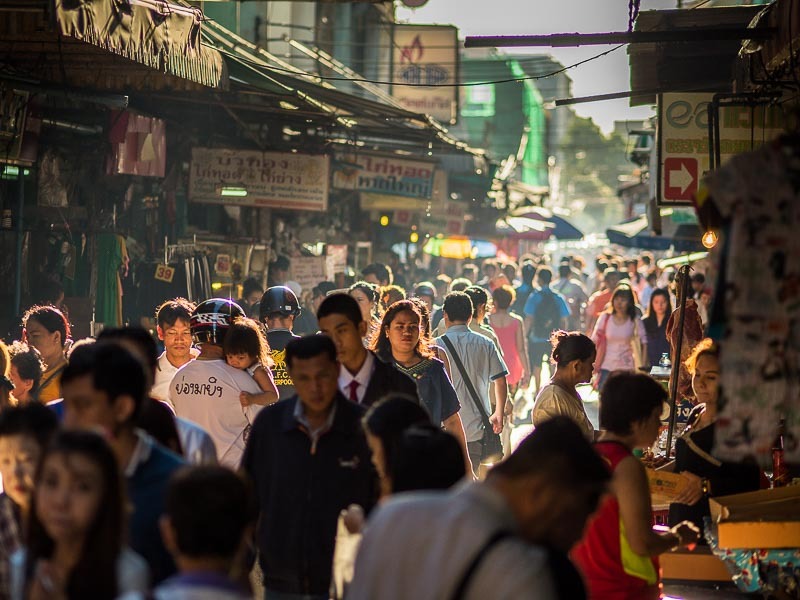 If you can't find what you're looking for in a Thai market, chances are it doesn't exist. The first "grocery store" or supermarket didn't open in Bangkok until 1974, years after we left Bangkok the first time. Even though there have been supermarkets in Bangkok for more than 40 years, and you can find some sort of a supermarket in almost every neighborhood in Bangkok, many people still shop in the markets. 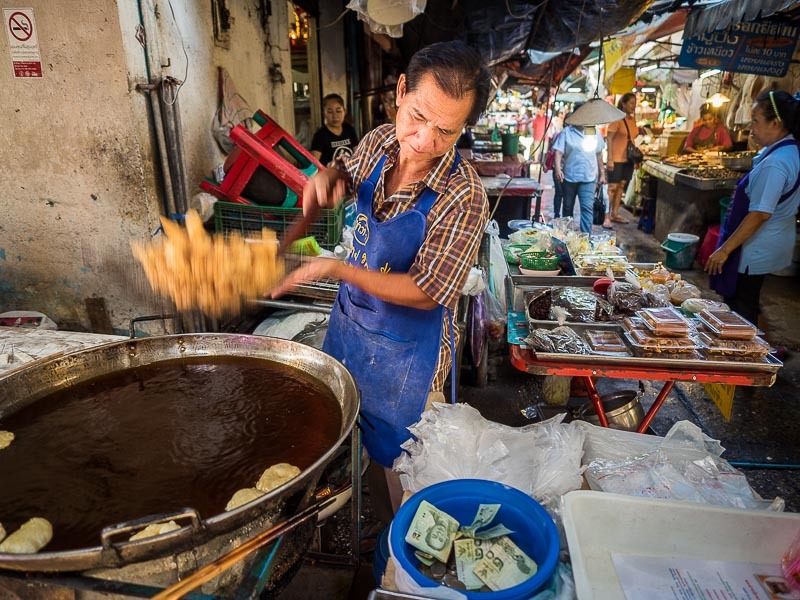 In Bang Chak market, a vendor takes a fresh batch of Chinese donuts, called patongos, out of the fryer, which is a giant wok filled with oil. Patangos are sort of like beignets without the powdered sugar. 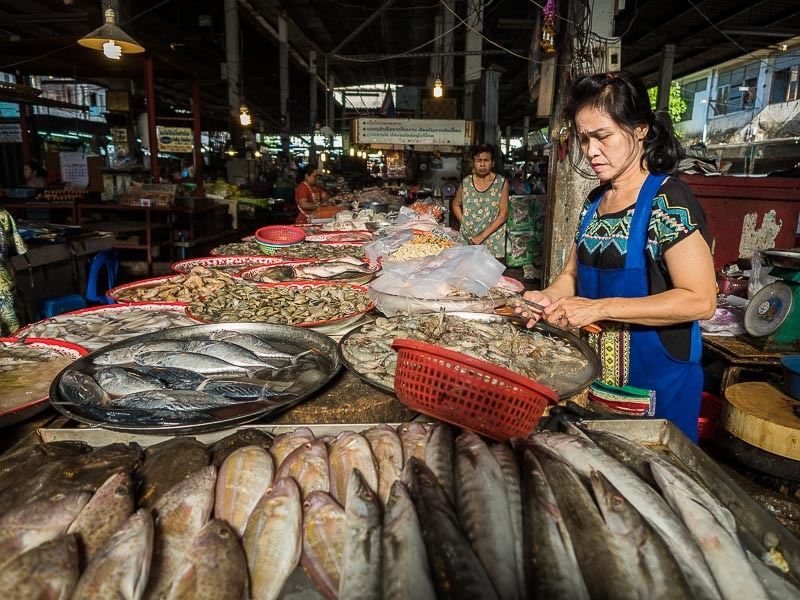 But in Bangkok, markets are disappearing as the modern supermarkets take over. This is especially true along the BTS lines, the elevated trains that move Bangkokians with science fiction like efficiency. The neighborhoods along the BTS lines are fully built out and new development means tearing down existing development. All through central Bangkok, there are high end condominiums and shopping malls attached to the BTS stations. The further out you go from central Bangkok, the more traditional it is. I don't mean rice paddies or rickshaws - those have been gone for generations. I do mean traditional three and four storey shophouses (shop on the main floor, apartments above) and wet markets. But as land starved Bangkok looks for ways to expand, those old shophouses and markets are in danger of disappearing. A fishmonger's stall in Bang Chak Market. Bang Chak Market is the latest market to fall to the wrecking ball. It was never in the first tier of Bangkok markets, not like Khlong Toey. It's a community market that serves the people who live around it. Most of the shophouses are already gone. 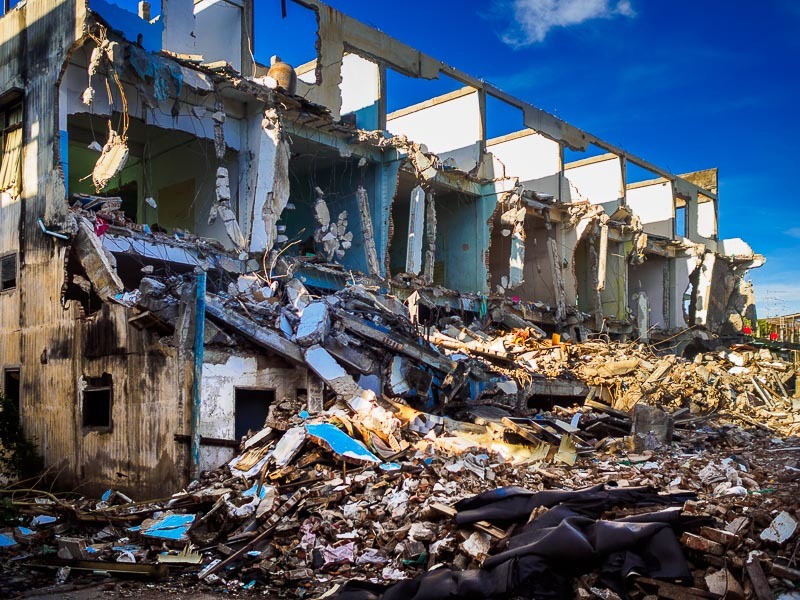 This is the only remaining block and they're being demolished as you read this. It's sad to see the old markets and the street food areas, like the one at Soi 38, disappear. I'm not just being sentimental or pining for the "good old days." These new developments are not sustainable, they contribute to the city's already unbelievable traffic gridlock and they consume huge amounts of electricity. The real estate along the Skytrain is especially popular but the Skytrain's success is also its great failing. Rush hour trains are so crowded you sometimes have to queue up and wait for several trains to go by before there's room to squeeze into one. The new condo and shopping developments only contribute to the congestion. People go past the front of the shophouses. I'm also concerned about what happens to the people who are living in the neighborhood. I look at the markets as a part of a self contained eco-system. Take away the market and the other parts of the eco-system whither. 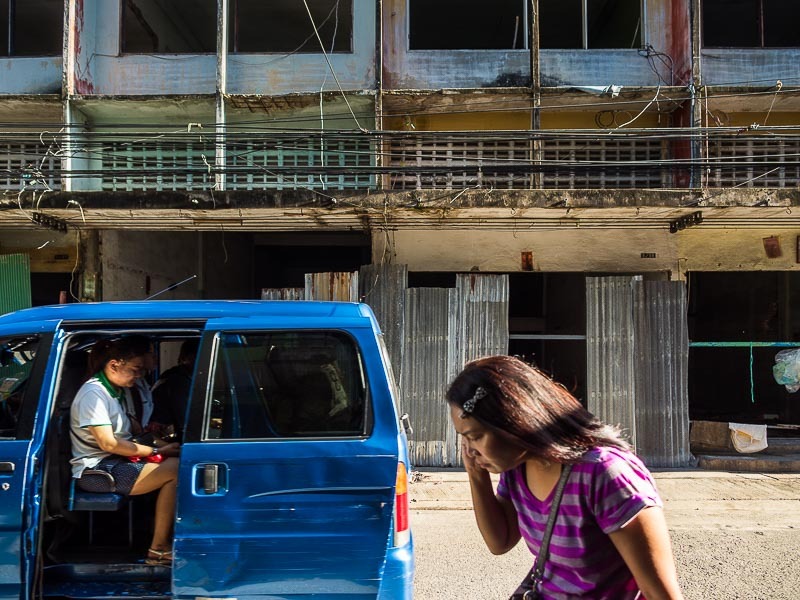 The families who live in the neighborhood are forced out by circumstances and the neighborhood loses its vitality. Vendors make and sell marigold garlands in the market. There are more pictures of the market in my archive and available from ZUMA Press.